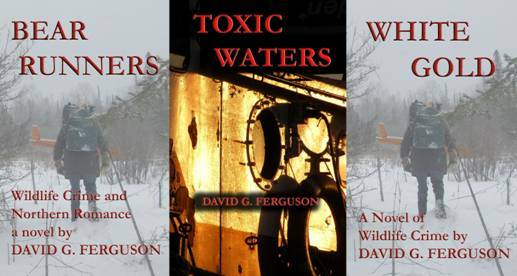 How I Became an Author: I was born in Owen Sound by the shores of Lake Huron; spent my childhood messing about in boats; could not pay attention in school because my mind was always wandering on some make believe adventure (usually on the water); engaged in an outdoor career with the Ministry of Natural Resources (MNR) where boating played a major role during the open water seasons. One of the best periods in my MNR career was the three years I spent in Moosonee District, covering the Hudson and James Bay Lowlands in northeastern Ontario. Travelling on shallow, silt laden rivers and out in the open on James Bay added an entirely new dimension to my boating experience, and frequent bush plane travel was an added bonus. In my position as a conservation officer, ‘telling the truth, the whole truth and nothing but the truth’ was essential to maintaining my professional credibility, BUT there was always an urge to embellish. Writing fiction was the obvious outlet for that urge. My stories are inspired by my work and life experiences. My Characters are composites of the many people I’ve met both on the job and off over a lifetime. Dave will talk about his experiences and about his books. His first book takes place in the North Channel. Central to the theme of the book are the adventures of a sailor. Dave will have copies of his books, which I have read, on sale after his presentation.